We’re a mere 108 days from the 86th annual Academy Awards, and America remains firmly not in the grip of Oscar fever! Can you feel the growing throb of vague, half-aware expectation mixed with polite indifference? It’s catching! One reason for this is that, while contenders like 12 Years a Slave, All Is Lost, and Dallas Buyers Club are chugging along, they still, after a combined 67 days in release, have collectively grossed less than Thor: The Dark World took in by about 8:30 p.m. on its first day. However, there’s also an increasing disconnect between Oscar talk and real-world moviegoers. In awardsland, pundits have been masticating the chances of Joel and Ethan Coen’s Inside Llewyn Davis and Alexander Payne’s Nebraska since May, when the movies played at Cannes. And more recently, buzz about fall festival films like Saving Mr. Banks, Philomena, Out of the Furnace, Labor Day, August: Osage County, and Lone Survivor has had predictors hastily revising and re-revising their cheat sheets. But back on earth, none of those movies has actually, you know, opened — and that’s not even counting David O. Russell’s American Hustle and Martin Scorsese’s The Wolf of Wall Street, which remain off limits even to those of us whose job is to shake them by the ankles and see if any trophies fall out. In September, I got some ribbing from colleagues for saying it was too early to make predictions. I hope I don’t cause any of them to have an aneurysm by ever so gently saying it again two months later. At the very least, can we stipulate that Variety‘s pronouncement that 2013 offers “more terrific awards possibilities than ever” feels slightly out of sync with the fare at your local multiplex, which is playing Free Birds, Last Vegas, Ender’s Game, and Bad Grandpa? The debatable logic behind those labels is presumably that the act of creating characters from whole cloth and generating a narrative for them is a different art than figuring out how a preexisting story in another form can be successfully transmuted into a motion picture script. This makes perfect sense if, for instance, we’re talking about Tracy Letts assiduously pruning his play August: Osage County versus Spike Jonze inventing an entirely new world with its own emotional and ethical dilemmas in Her. But in practice, it’s one big gray area. Here’s an example: One of the best screenplays to be produced this year is the one for Before Midnight, which was written by Richard Linklater in collaboration with the film’s two stars, Ethan Hawke and Julie Delpy. It’s a particularly gorgeous example of dialogue writing, with long, argumentative scenes between impassioned and articulate self-deceivers that play out with lurchy verisimilitude, replete with sudden mood shifts and feints and cul-de-sacs and repetitions that will be recognizable to anyone who knows how to have a good fight. Before Midnight is considered an adaptation solely because its two main characters appeared in two previous movies. Never mind that the story and plot and situational crisis explored in the new film were all invented expressly for Before Midnight and exist in no other form; in awardsland, it’s “adapted,” just not actually from anything. By contrast, Ryan Coogler’s excellent, searching screenplay for Fruitvale Station is about a real man, his real life, and a real criminal case. It is, in its own way, adapted, but what it’s adapted from is a real man’s life and death rather than a story about that man — and thus it’s considered “original.” It’s a measure of the Academy’s ongoing bewilderment that not so long ago, those two movies would have found themselves competing head-to-head. For most of the ’60s, ’70s, and ’80s, Best Adapted Screenplay was called Best Screenplay Based on Material From Another Medium, and therefore would not have included Before Midnight, which is based on characters (not material) from the same medium. Most awards couldn’t exist without arbitrary distinctions, and not all of them are terrible. Over the years, people have argued that splitting actors by gender serves merely to reinforce bias and ghettoize women; and certainly, splitting actors by the size of their roles generates perennial contention about what constitutes a lead or a supporting performance. Maybe, they say, there should be only two acting categories. Or one! I get the point, but it always feels like there’s something severe and withholding behind it, as if giving a single acting award, with maybe just three nominees, would somehow signify heightened purity or integrity. (Yes, it would shorten the ceremony, but if all you care about is a shorter ceremony, don’t watch.) If the purpose (and arguably greatest value) of the Oscars is to shed light on worthy work, I’d rather see 20 actors honored than 10, and 10 screenplays, not just five. However, why not take Weinstein’s lead and broaden the definition of originality even more? Looking over the last several years of Adapted Screenplay nominees and winners, it’s clear that several would have more properly been designated as original. Aaron Sorkin’s Social Network script was an imaginative creation the structure, tone, voice, and point of which were all the movie’s own; it bore only a third-cousin-once-removed resemblance to the book that was its credited source material. The great political comedy In the Loop used characters from a British TV series but created a brand-new story for them. District 9 was an “adaptation” of a short film by the same filmmaker who made the feature, which is a bit like saying the movie was an adaptation of its own first draft. Toy Story 3 was an original story that happened to be a sequel; calling it an adaptation was convenient but not accurate. And The Curious Case of Benjamin Button, though billed (and nominated) as an adaptation of an F. Scott Fitzgerald story, was really an original script that (like the upcoming The Secret Life of Walter Mitty) used an old idea and title as a jumping-off point — exactly the distinction that got The Butler moved over to Original Screenplay. There’s a vast difference between those adapted-in-name-only scripts and work like Tinker Tailor Soldier Spy, Life of Pi, Frost/Nixon, and Precious, the primary creative task of each of which was to bring an existing story to life as a film. If a case is to be made that different and equally award-worthy forms of film writing exist, then more attention should be paid to what those differences truly are. Right now, the ambivalence of the writers branch about “Best Adapted Screenplay” starts right in its name. Is the award intended to honor the best screenplay that happens to be adapted, or the best job of adaptation? Aren’t those two criteria different? Taken separately, mightn’t they produce different winners? While I am loath to suggest awards inflation — that way lies madness, a.k.a. the Grammys — I will happily make an exception for any rule modifications that might allow more trophies to go to writers, who are misunderstood, ignored, underheralded, belittled, and rebuffed for too many of the other 364 days of the movie year. For a while, the Academy gave three writing prizes — how about a new version of that old scheme? Best Original Screenplay, after all, used to be called “Best Screenplay Based on Factual Material OR Material Not Previously Published or Produced.” Look closely at that blob of windy legalese; it’s an omnibus definition that practically announces its intention to squeeze two separate achievements into one category. So let’s split them up. This year, Best Original Screenplay — in other words, a screenplay based on material not previously produced or published — could encompass works of invention like Before Midnight, Her, Enough Said, Nebraska, Inside Llewyn Davis, and Blue Jasmine. Best Screenplay Based on Factual Material could be a home for 12 Years a Slave, The Butler, Captain Phillips, Fruitvale Station, Saving Mr. Banks, and, if they’re any good, American Hustle or The Wolf of Wall Street. And a third category, Best Adaptation, could be reserved for honoring the transpositional effectiveness of films like August: Osage County, Labor Day, Much Ado About Nothing, Blue Is the Warmest Color, and The Book Thief, the winner to be decided by an apples-to-apples comparison of how well the writers wrestled an existing fictional narrative into cinematic form. That would, I know, make a whole new kind of mess. But it might be a mess that would force people — including voters — to think about what screenwriters actually do. 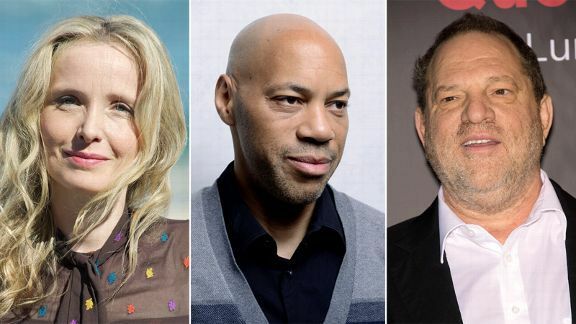 Instead, this year, we will all act as if John Ridley faced the same challenge with 12 Years a Slave as Julie Delpy did with Before Midnight. Nobody believes that — especially not writers. Why keep pretending? I would here like to differentiate Diabolical Harvey from Actual Harvey. Actual Harvey Weinstein is a tough, canny, and dedicated Oscar campaigner who sometimes wins, sometimes loses, and sometimes overreaches and gets busted for it. Diabolical Harvey is a useful monster, a largely imaginary figure whom other campaigners always insist is just one ugly maneuver away from hoodwinking Oscar voters into giving his movies everything. Regardless of what Actual Harvey is up to, Diabolical Harvey will always be a factor, because Diabolical Harvey is what gives other studios permission to get down in the mud themselves while pretending that their own nefarious strategies are necessary countermoves made to level the playing field. That take-your-medicine approach, by the way, is a press rather than publicity phenomenon and should probably be dropped before it does more harm than good. Voters don’t like to feel scolded into voting for a movie. Kris Tapley, who writes Hitfix’s In Contention column, has noted that “inspired by” buys you a degree of awards-season wiggle room that “based on” does not.